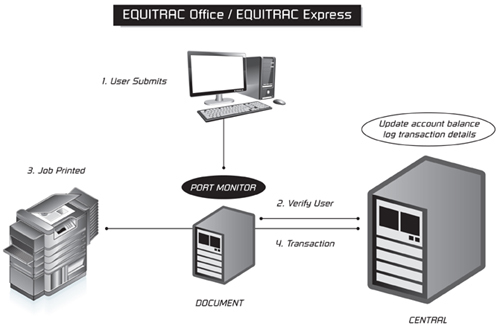 Equitrac Office© and Equitrac Express© are aids in cost recovery and print management solutions helping organizations control the printing practices in the workplace. With Equitrac, organizations can implement standards ensuring that every print device is used appropriately. The Equitrac solutions will allow organizations to reduce the amount of wasteful printing and provide organizations with a quicker ROI on the print devices being acquired.